In the stylish thriller Charade. Regina (Audrey Hepburn) finds herself pursued through the streets of Paris by several men in search of the fortune that her murdered husband stole from them. 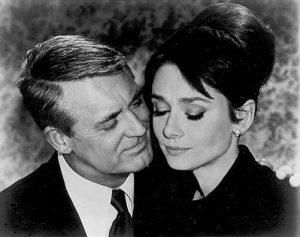 As her world becomes entangled with suspense, murder and plots twists, she finds herself leaning on a suave, charming stranger (Cary Grant) whose motives are unclear. Peter Joshua (Cary Grant, Mr. Blandings Builds His Dream House). The handsome stranger, who likewise falls in love with Regina. And keeps changing his story, and his alias. The underlying conflict of the story is: can she trust him? Will he betray her? Tex Panthollow (James Coburn, Vivacious Lady). One of the trio of criminals, trying to recover “their” money from Regina. Herman Scobie (George Kennedy, Airport). Another of the trio, the “muscle” of the group. Who loses an unfortunate fight with Peter. Leopold W. Gideon (Ned Glass, The Love Bug). The last of the trio.